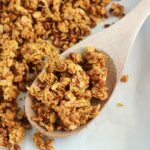 This Pumpkin Pie Granola recipe is packed with the classic fall flavor and has easily become a favorite. 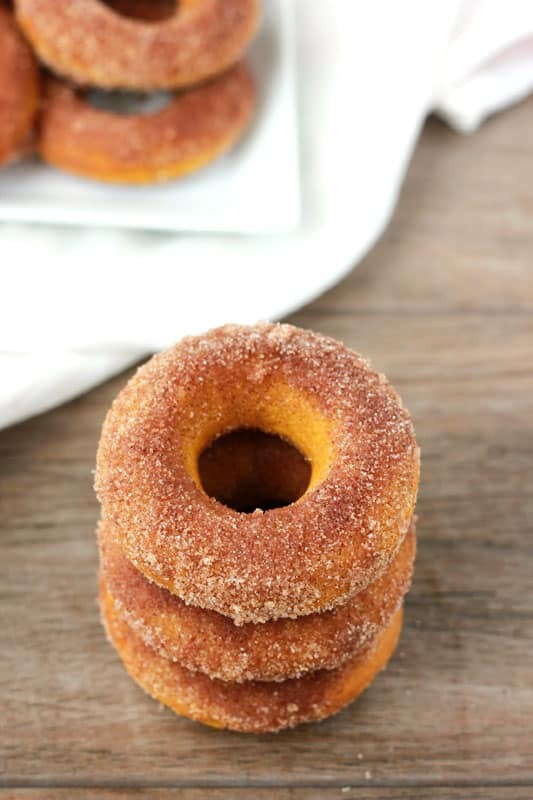 It is packed with real pumpkin flavor and a delicious way to snack! 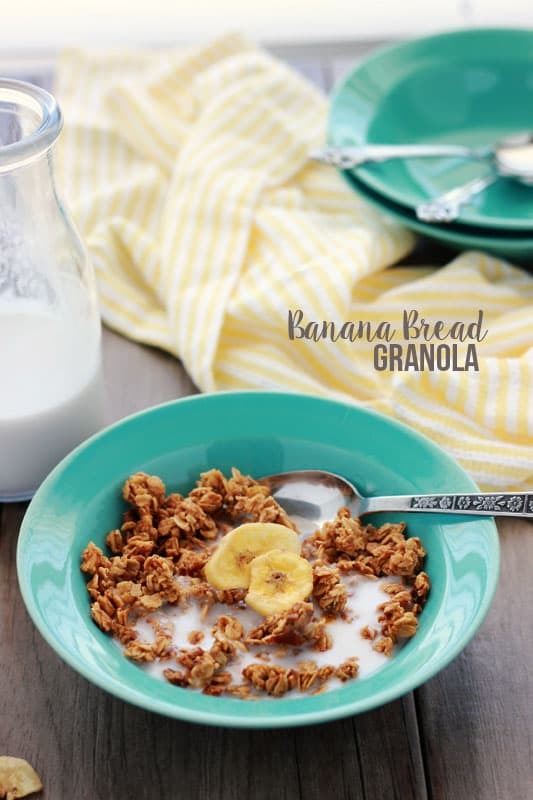 Confession… I am a granola addict. 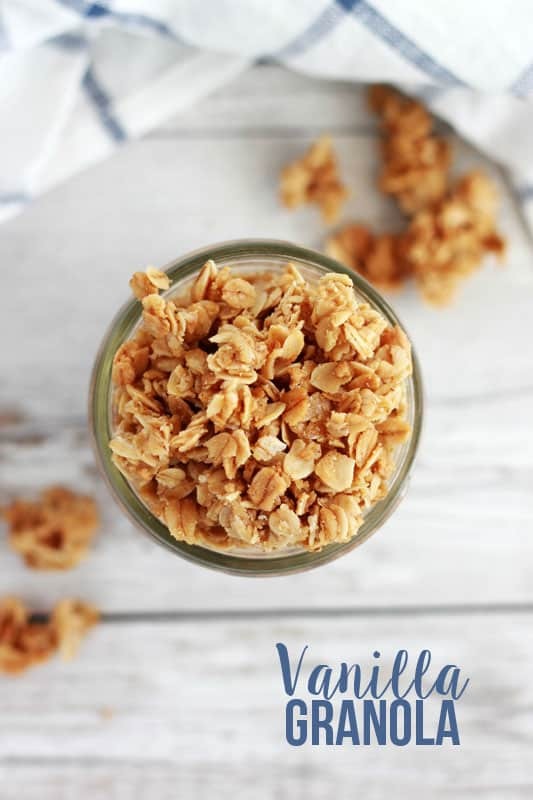 It is one of my ALL TIME favorite treats to make and munch on. For years I stuck to a basic Vanilla version. I never saw a need to adjust it because the flavor was A-MAZ-ING. It was one of those baked treats that would engulf my entire house in the most divine aroma and have both my husband and seven year old perched on our bar stools waiting for me to pull it out of the oven. Oh, and did I mention you could basically serve it on/in anything?! It wasn’t until recently that I started to crave a banana version and switched things up. It really was kind of a hit or miss recipe attempt that turned out incredible. It quickly became a recipe I’d make over and over and would watch it quickly disappear. 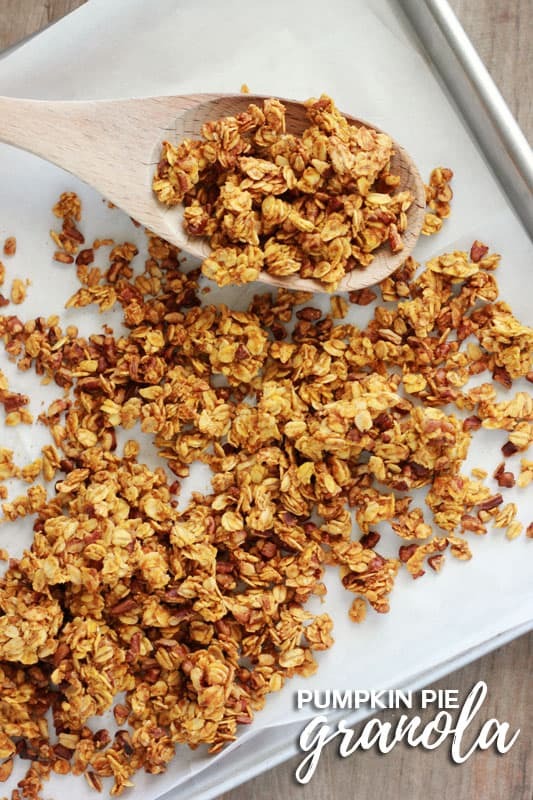 NOW, since it’s fall I thought it couldn’t be too hard to turn the banana granola into a PUMPKIN version, right? Dudes… (that’s right. I called you dude)… This. Is. Pumpkintastic. I knew immediately that we were going to love this. Just stirring together the ingredients had my kitchen smelling like fall and me wishing I was sipping on a pumpkin spice latte (sidebar… I’m actually not really that into PSL’s. Shhhh… Don’t tell). Can you imagine how much better it got as it slowly baked to golden perfection?? SO basically you need to make this. Now. Eat all of it on your own, package it up for gifts, or stash some in the freezer for those emergency cravings or quick grab-and-go breakfast. No need to thank me. 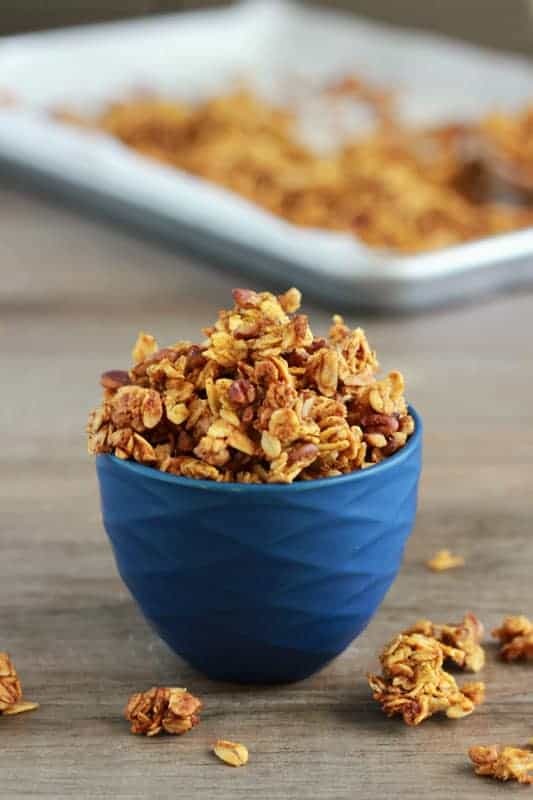 Whisk together the oats, brown sugar, salt, pumpkin pie spice, and pecans in a large mixing bowl. Microwave the coconut oil and honey for just a few seconds in a small separate bowl until liquid. Whisk in your vanilla and pumpkin puree. 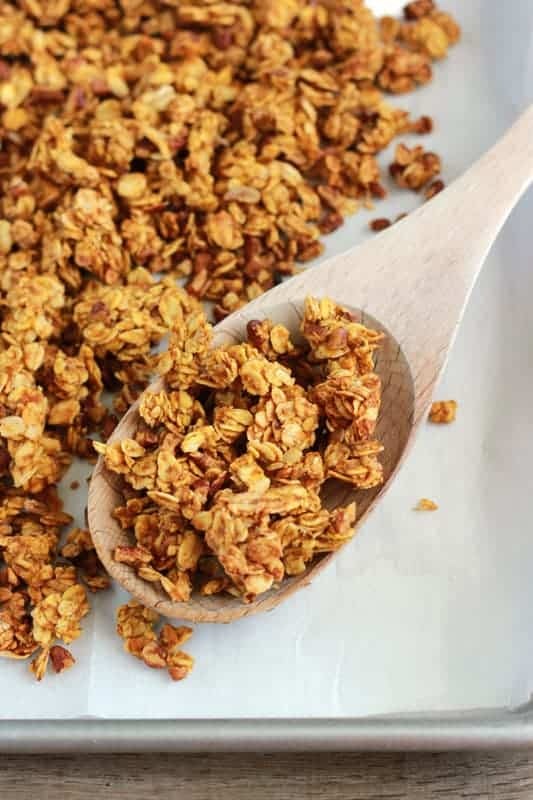 For a more clump filled granola make sure you keep the granola in a thicker layer. You may need to increase baking time by 10-15 minutes.